This form allows you to order exams with payment either by check or by PayPal (with an additional $3 processing fee). Please note that a $2 non-refundable fee underwriting the costs of the examination is required for each contestant. 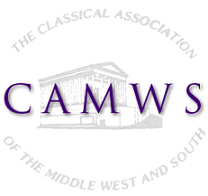 If you have any questions or problems with this process, please contact camws@camws.org. For copies of the most recent exams, please go to camws.org/awards/school.php. Are you willing to serve as a reader/grader for the contest. Anyone registering large numbers of students (40+) is stronlgy encouraged to help with scoring. A modest gift certificate will be given to anyone who volunteers and reads. If you prefer to pay by check, then click "None" below, print out the email confirmation message you will receive after submitting and mail a copy of this confirmation, along with payment, to CAMWS, c/o Monmouth College, 700 E. Broadway, Monmouth IL 61462. If you prefer to pay on-line via PayPal, then click on "Non-refundable handling fee [$3.00]." Then, when you click 'Submit' you will be taken to a shopping cart showing how many examination entries you requested and one $3 processing fee, with a link for checkout by Paypal.